It’s intriguing to look back at coverage of the DRL the last time this was a major issue. Mike Filey passed along a clipping from the Star from December 2, 1982 that makes interesting reading. My comments are at the end in Postscript 2. A postscript has been added discussing the various demand simulations as a group rather than individually. Charts of total demand southbound from Bloor Station as well as pedestrian activity at Bloor-Yonge are provided to consolidate information from several exhibits in the background paper. This article has been reformatted to merge additional information from the background study as well as illustrations into the text. At its meeting on October 24, 2012, the TTC will consider a report on the Downtown Rapid Transit Expansion Study. The full background paper is also available on the TTC’s website. 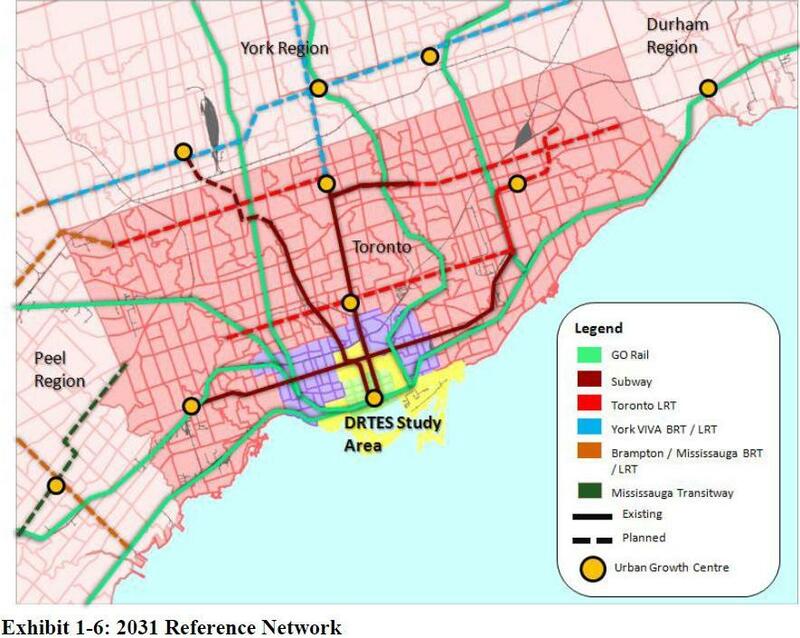 A study by the City of Toronto and TTC, including consultations with Metrolinx, concludes that transit demand to the core by 2031 will grow at a rate that exceeds the capacity of all of the current and planned transit facilities. Ridership will be 51% higher than today. The residential population south of College from Bathurst to Parliament will grow by 83%, and employment by 28%. Capacity is an issue today as Table A-1 in the background paper shows. Several corridors into downtown are already operating over their design capacity. This is particularly the case on GO where the target is to have few standees, and there is more room for additional passengers in the design capacity than on the TTC subway services. Table A-2 shows the projections for 2031. All of the shortfalls are on GO, but the TTC lines are close to saturation. This presumes a considerable increase in the capacity of various lines. For example, the YUS goes from a design capacity of 26,000 to 38,000 passengers per hour (pphpd), an increase of 46% which may not actually be achievable. Similarly, the BD line goes to 33,000 pphpd, an increase of 27%. Exhibit 1-10 shows the components of projected capacity increase including 36% from running trains closer together. As discussed at some length on this site previously, the constraints on headways arise at terminal stations. A 36% increase in trains/hour implies a headway of about 100 seconds as compared with 140 today. This cannot be achieved with existing terminal track geometry, not to mention the leisurely crew practices at terminals. On the GO lines, the projected capacity on Lakeshore West doubles, and smaller increases are seen on other routes. 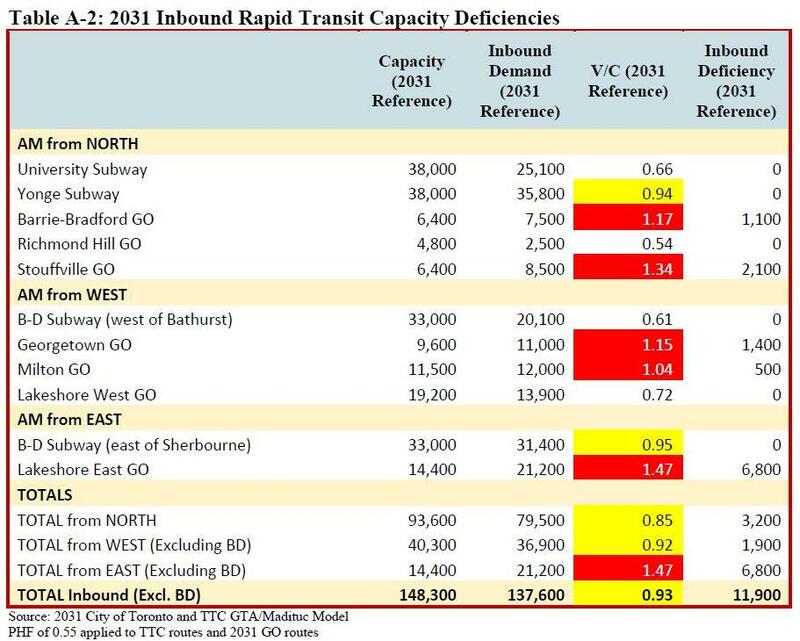 It is worth noting that the projected capacity of the north-south corridors to Stouffville, Richmond Hill and Barrie are nowhere near the level of service implied by The Big Move, probably because these lines are not targets for early electrification. This contributes to the capacity shortfall in the northern sector. Recommendation 1 of the study includes encouragement that Metrolinx review the possibility of increased capacity in those three corridors. The full list of lines included in the modelled network can be found in the background study at section 1.2.1. The streetcar system (plus sidewalks and bike lanes) will absorb the growth in short-distance travel to and from the core. This has implications for the future of the streetcar fleet once the new LFLRVs come into service — the immediate retirement of older equipment may have to wait while the backlog of growing demand is addressed. Cycling, pedestrians and transit will require dedication of an increased amount of road space including transit priorities and aggressive controls on abuse by motorists and delivery vehicles. With growth numbers like those, the idea that people will breeze through a congestion-free downtown by car is laughable. Exhibit 1-8 in the background study gives a revealing breakdown of trips arriving in the core area during the AM peak. GO has 88% of the trips from Peel Region, 95% of the trips from Durham (on a much smaller base than Peel), but only 55% of the trips from York Region. This shows the degree to which GO has not picked up demand from the north, and this demand is now filling up the Toronto subway system. This problem persists in the 2031 projections in Exhibit 1-9. The TTC’s share of trips from York Region to downtown falls only from 45% to 41%. GO may be adding capacity, but only slightly faster than what is needed to handle greater demand, not as an incentive to shift riding from the TTC network. Also revealing is the breakdown of trips within the 416. Of the trips from east and west of downtown entering the core, the surface routes carry about 30%. The outside-416 trips swamp the local 416 trips, and surface trips only make up 8% of the overall total. However, the surface system is an important part of local travel within the city, and this role should increase as the population south of Bloor rises. Exhibit 1-9 implies a fall in the absolute number of trips handled by the surface network outside the core area boundaries. The percentage share for surface routes falls from 30% to 23% while the total number of trips does not rise much. This implies a diversion of trips to other modes without the addition of any east-west subway capacity other than better service on the BD line. I am not sure whether this represents a real shift or if it is an artifact of the modelling process. 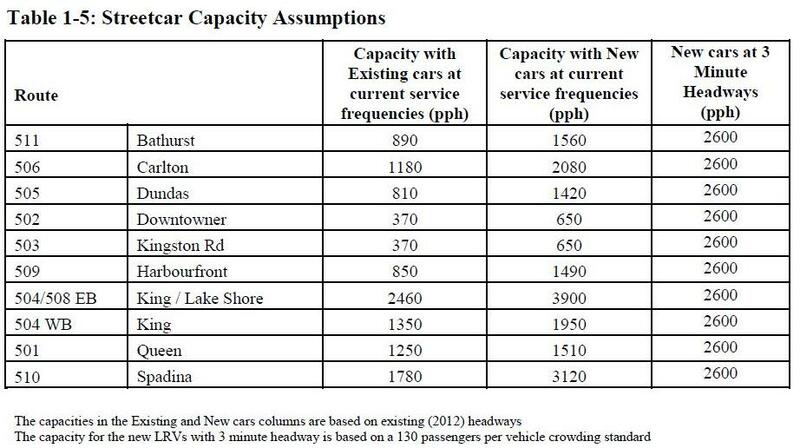 Table 1-5 gives comparative streetcar capacity figures for the downtown routes with three sets of figures: existing, the effect of a 1-for-1 replacement by new LFLRVs, and the capacity of a nominal 3-minute headway. What is not shown is any indication of the latent demand on streetcar routes whose service has been frozen for years, nor of the effect of current and planned development that will increase demand along the streetcar lines. Elsewhere in the report, the TTC claims that 2,600 is the practical capacity of a streetcar line based on a 3-minute headway of LFLRVs. This statement must be challenged on two counts. First, it is already agreed that more road space and time must be given to transit, not less. Second, if we presume that 2,600 is the upper bound for a surface line in mixed traffic, we face huge costs for demands that are far below those where subway operation is affordable. The subway network’s function will be to handle medium-distance trips, although “medium” is a bit of a stretch when the subway will eventually extend into territory once the preserve of GO transit’s rail and bus network. Indeed, one reason for crowding on the subway is the limited growth of GO thanks to constraints at Queen’s Park. Metrolinx talks a good game, but it’s always “subject to funding”, and little of that materializes. Do not proceed with the Yonge Subway Extension in advance of the provision of additional rapid transit capacity into the downtown. TTC and the City of Toronto undertake the studies and actions needed to protect for a possible future expansion of Bloor-Yonge station and develop a plan for improvements that will be needed in the future. Maintain, and where possible enhance policies in the City’s Official Plan that will help to minimise the need for future investments in rapid transit facilities. TTC conduct further investigation into the future demands and transfers expected at subway stations in the downtown and identify those stations that should be given priority in TTC’s station modernization program. King Station in particular will see high passenger demand and operational issues regardless of the presence of a DRL. These recommendations emphasize that the DRL is not something about which decisions can be made in a vacuum. It is a pre-requisite for expansion of the existing Yonge line, and other parts of the network, both transit and roads, will have to adapt to provide greater capacity in the system. This is not a matter of drawing one line on a map, finding some money, and building it. Because more pressure on network capacity lies east of Yonge, each group of options includes an “east only” version as well as an “east + west” option. 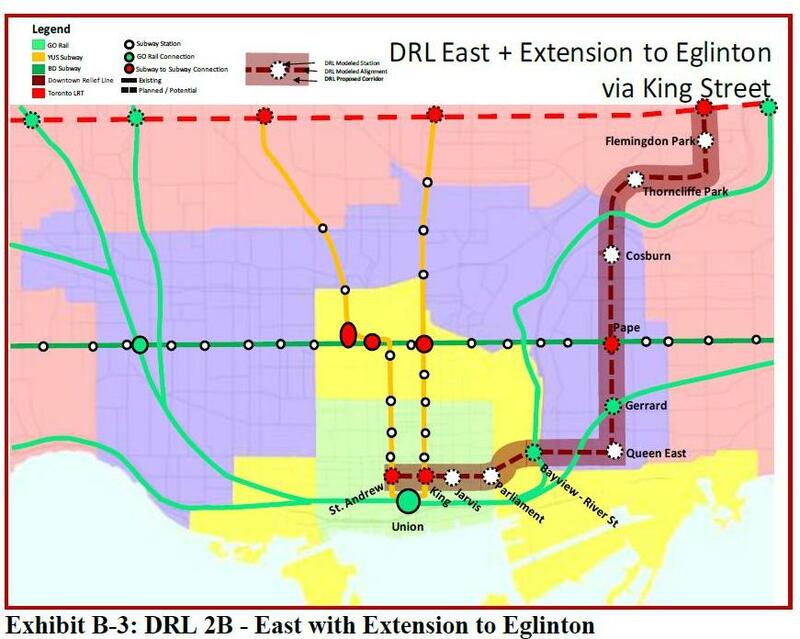 The DRL options include versions ending at Pape Station or extending north to Don Mills and Eglinton. This gives six configurations. Leaving aside the choice of inside-416 stations for the termini of a Lakeshore route, the basic problem it has is that it competes with the Bloor-Danforth line but does not shift much riding off of Yonge-University. Attention, therefore, focuses on the DRL options. 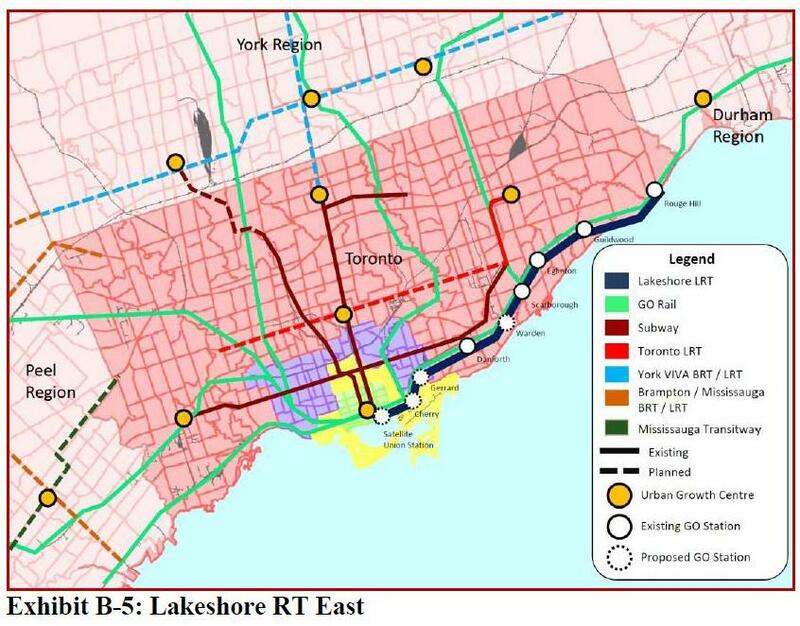 The TTC notes that some benefits could be obtained by improvements to GO’s north-south services, but these are outside the scope of their study. Some work has already been done looking at a network adapted from the one used in the electrification study. This is precisely the sort of detail that should be made public to inform discussion of options rather than remaining hidden within Metrolinx. Any debate about future funding streams needs to know what is possible and how soon we might see it. What we are now seeing is the cumulative effect of decades of deferred investment in transit across the region at a time when transit demand is taking off. A few more trains here or there, and a subway extension every few decades, and piles of glossy reports just are not enough. Well, no, actually. What was happening was that the TTC planned to gradually eliminate streetcars and replace them with inferior service, and with no guarantee that a Queen subway (which would not have served large areas of the streetcar network anyhow) would ever be built. A tiny bit of revisionist history. The paragraph goes on to note that the Queen subway was cancelled to concentrate efforts in the suburbs. … all of these projects could conceivably improve carry capacity on that line by 40% or more over time. Funding and completing them could put off the need for the $10 billion or so Downtown Relief Subway Line by 10 or 20 years at a fraction of the cost. The TTC has not provided a consolidated costing of these improvements nor have they indicated which of them might not be required if a DRL were implemented. Almost all of the list above is not funded, and cost estimates, such as they exist, are scattered through multiple projects in the Capital Budget. The comment cited above uses a DRL cost ($10b) which is larger than the price quoted even for a full DRL from Dundas West to Eglinton ($8.3b). At this point, the TTC is only talking about a $3.2b route from downtown to Pape Station. One wonders just how deliberately misleading the anti-DRL statements from TTC management are and have been for past decades. A further problem is that the TTC mixes improvements that actually provide net new capacity with those intended to improve reliability. If, for example, there are fewer track fires because of platform doors, this improves reliability, but it does not increase capacity unless we assume that such fires are so common that they will always interrupt peak service. Fires and suicides are not the only source of service delays, and an external review of the TTC has already reported that until they can get their reliability in much better shape, achieving much higher capacity is impossible. Pape is not the place to stop, and the line should go north to Eglinton. This will intercept more traffic and will eliminate some of the need for passenger transfer capacity at Pape and Danforth. Such a line would provide much improved transit to major neighbourhoods at Thorncliffe and Flemingdon Parks, and would be more than a diversionary route for traffic on the Danforth subway. 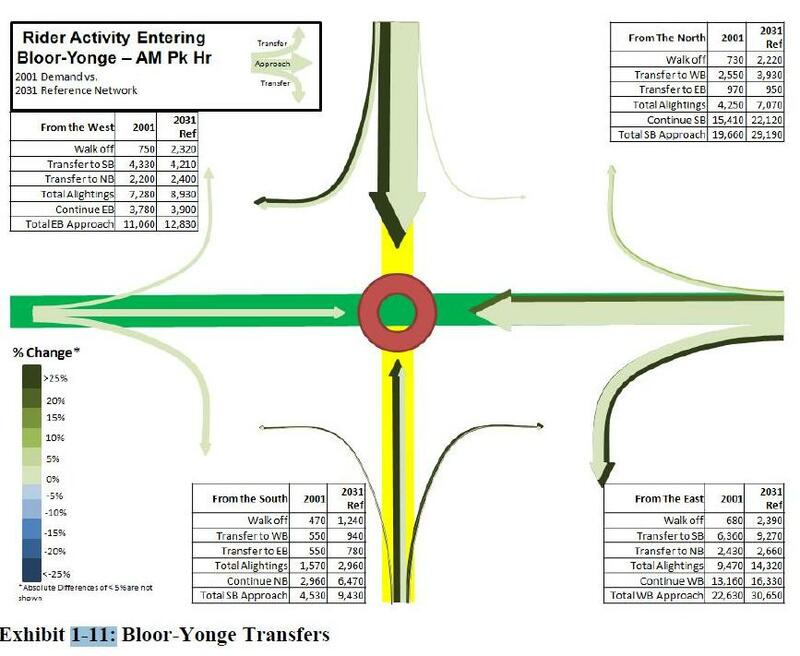 Exhibit 1-11 gives an overview of existing and projected transfer movements at Bloor-Yonge. These will increase substantially by 2031, and the station as now configured cannot handle the added pedestrian activity. 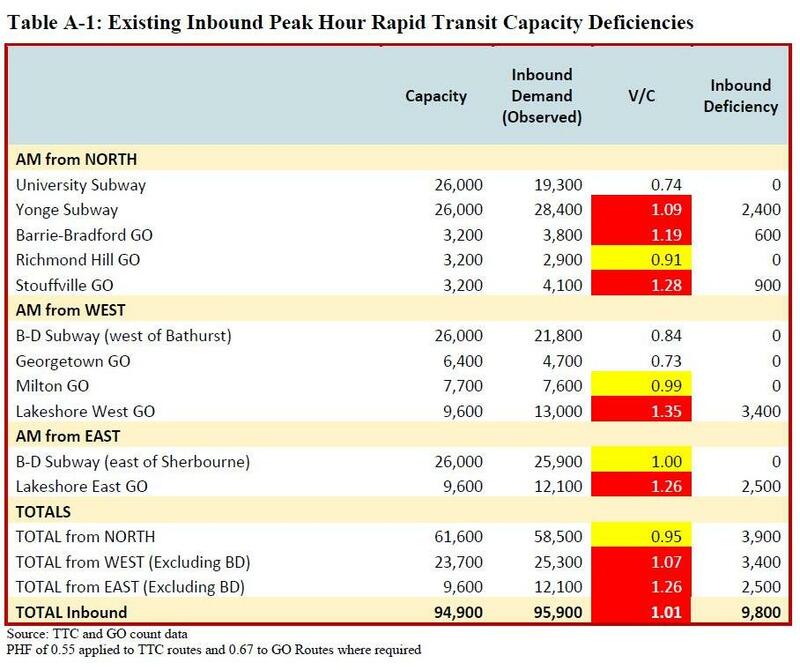 The TTC has a separate study underway of capacity at Bloor-Yonge, but this has not yet been published. The question then will be whether the proposed improvement to station capacity is physically possible, affordable and acceptable to nearby landowners who may be affected. If we cannot handle more transfer movements at Bloor-Yonge, a discussion of increase line capacity runs aground fairly quickly. 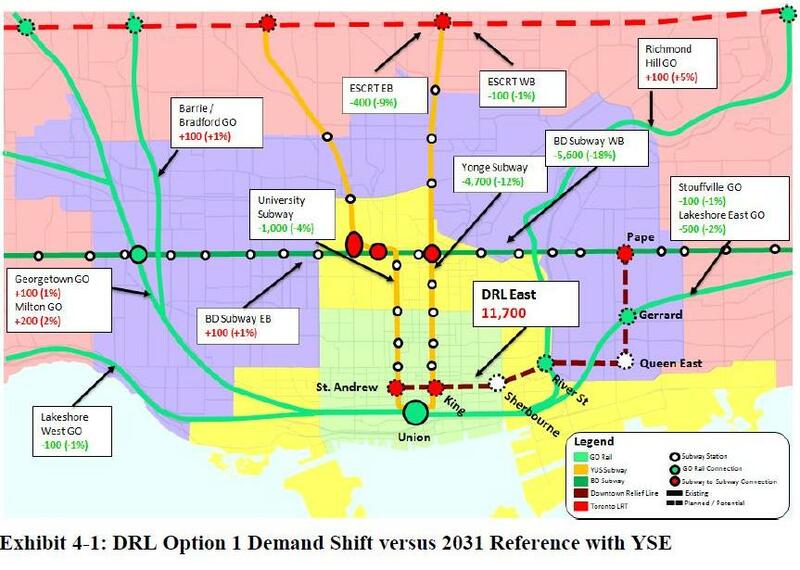 Detailed projections for the DRL show that it will have considerable effects in reducing demand at Bloor-Yonge. When this is combined with the possible benefit of increase north-south capacity on GO, heroic work at Bloor-Yonge to accommodate new transfer capacity may not be required. The TTC, however, seems to have the attitude that it is needed no matter what. The validity of this position should be challenged as the relative benefit, costs and effects of various combinations of options are reviewed. Exhibits 1-12 and 1-13 examine projected increase in station demands on the downtown “U” and shows very large changes in passengers entering the subway from Queen Street south. Most affected is Union where boardings would triple from 5,700 to 17,300. Other stations have comparable ratios (3X) but many fewer passengers. The effect of higher subway ridership shows up in all stations’ departure numbers. 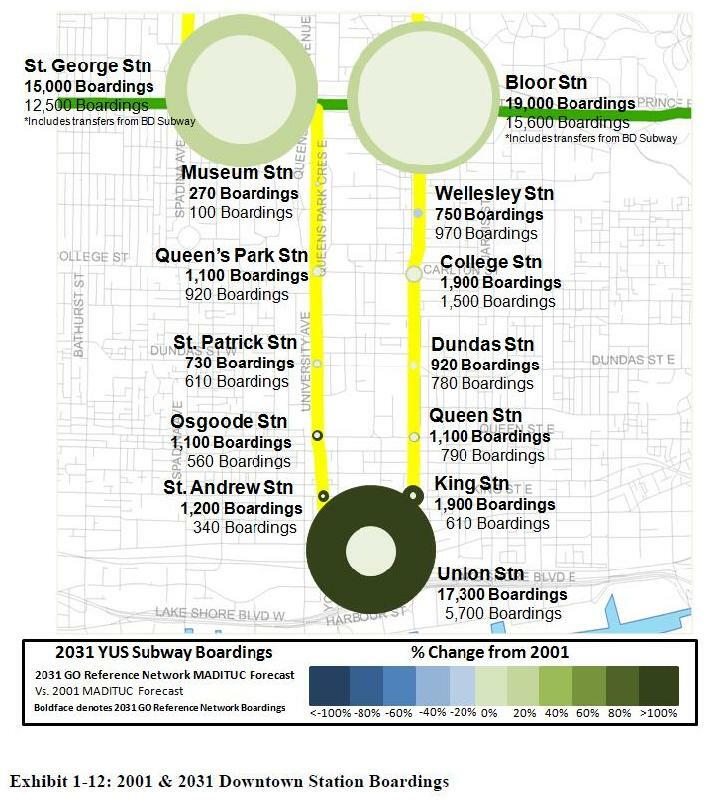 The combined effect of these changes shows the need for more station capacity along the Yonge-University line, not just at the two key stations. The diagrams below are only those showing overall changes in demand flow for each option. Many more details are available in section 4 of the background paper. DRL east to Danforth: The projected peak demand westbound to Yonge is 11,700 although fewer riders are diverted from the Danforth (5,600), Yonge (4,700) and University (1,000) subways. The model presumes a GO connection at Gerrard that would attract about 3,000 transferees per hour at peak. 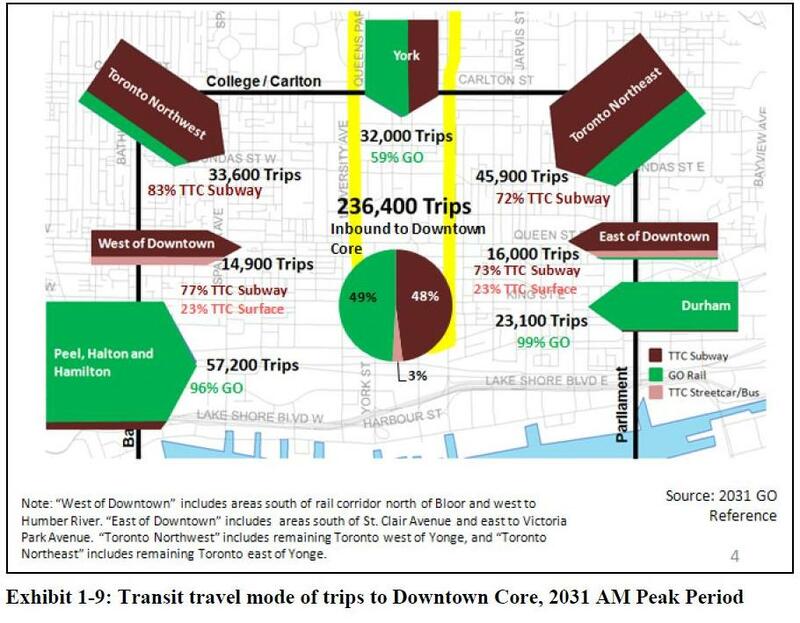 The number of boardings at Pape is 9,400, considerably larger than the number of trips diverted from the Danforth subway, and this likely shows the volume of traffic attracted from the north (something the study’s authors appear to have missed). This option also reduces the west-to-south transfer demand at Bloor-Yonge to below 2001 levels. DRL from Dundas West to Danforth: When the western leg of the DRL is added, demand at the peak point east of Yonge goes up to 13,600 because destinations west of University have been added as options for riders using the DRL. Anyone who has seen the substantial counterpeak demand on the King car going to offices west of downtown will understand this pattern. The biggest change, understandably, is on the Bloor line west of St. George from which traffic would divert to the DRL west, and on the University line. Projected peak demand on the DRL west is 12,900, but this depends on substantial transfer traffic at Queen and Dufferin. 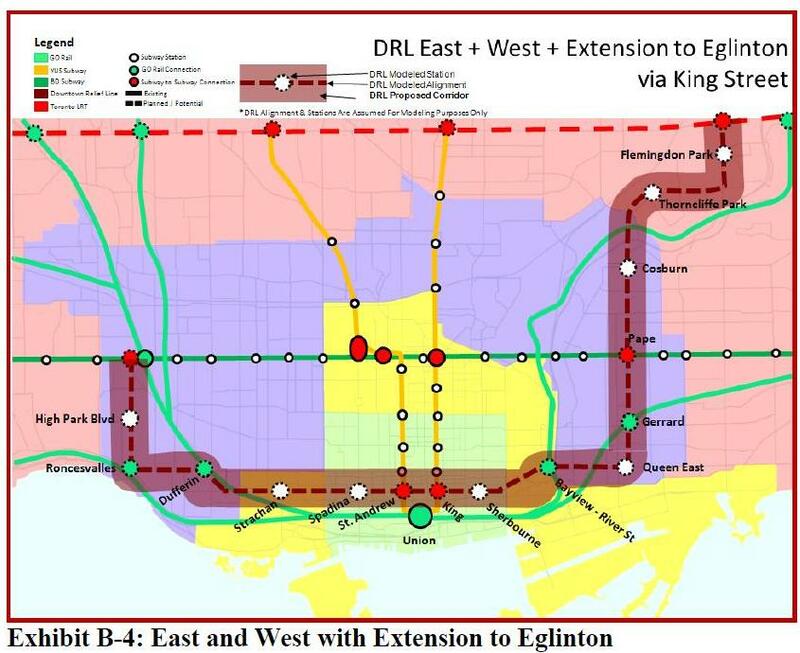 DRL with Eglinton Option: The Eglinton option does not have much effect on the peak point projected demand for the DRL east or for transfer traffic at Bloor-Yonge as compared with a line ending at Pape Station. This implies that the model is not finding much “new” demand to assign to the corridor with a faster trip between Eglinton and Danforth than on the existing bus routes. 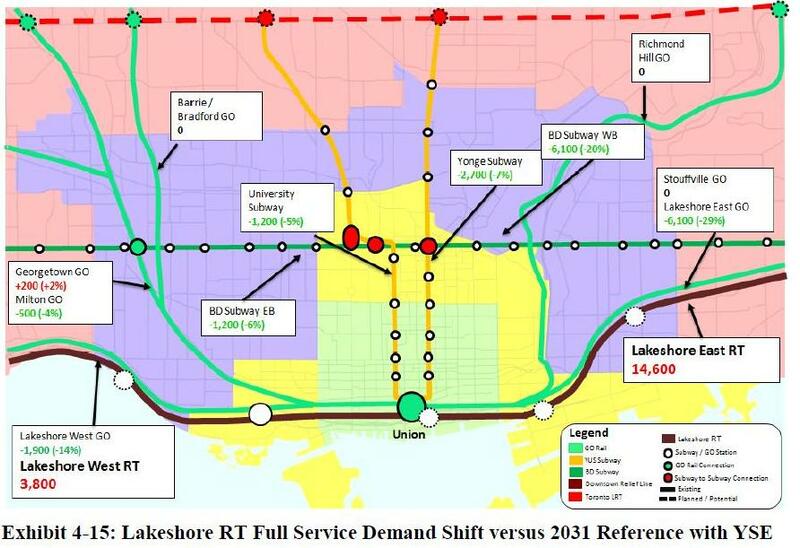 The Lakeshore options primarily affect the BD subway by diverting east-west trips away from it. 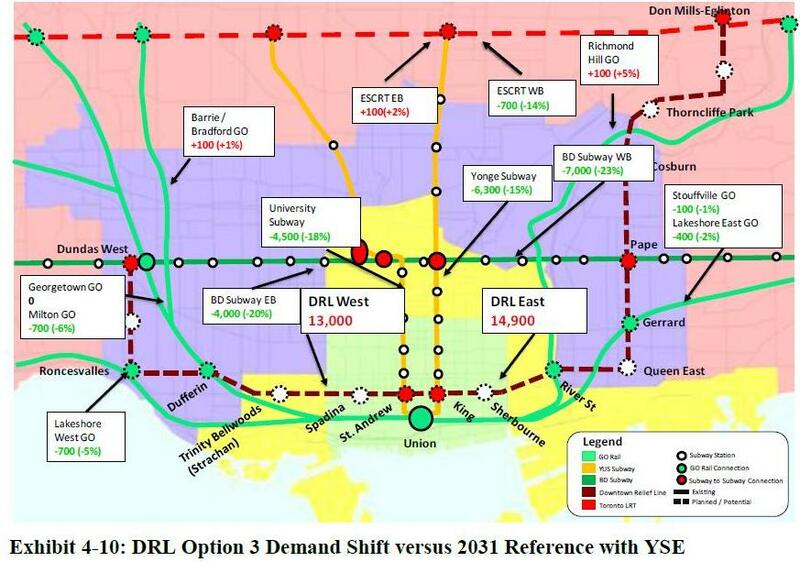 The effect on the Yonge line and on Bloor-Yonge station is considerably less than with the DRL options. A Lakeshore service also adds even more demand to Union Station which will be straining to handle growth in GO Transit and waterfront-based trips. As a general observation, the demand model appears to be “force feeding” the DRL by assumed GO-to-DRL transfers that require additional stops in locations where they may not be physically or operationally practical as well as the station capacity to handle the passenger movements. Whether riders would actually make these transfer moves requires more detailed analysis. This behaviour may be particularly hard to obtain in the PM peak where passengers would be trying to get on outbound GO trains already packed with riders from Union Station. This report begs a much more complex question — there is a pressing need for a detailed analysis of the transit system, all of it, not just the parts each agency cherry-picks for its own purposes. GO Transit must stop treating travel inside the 416 as something that is not its job. Transit studies need to look at surface route growth, not just at subways. The whole debate about LRT will remain a sideshow while the Ford brothers have influence in Toronto, but the larger problem of surface capacity on bus and streetcar routes will not go away. Some bus routes logically will transform to LRT, some to BRT, some to simply a mix of local and express buses. Road space for auto users will come under attack, and subways cannot possibly fulfill the needs in every corridor. All of our transit lines will need more money for fleet growth, garaging, operations and maintenance. In the 905, we need to know the implications of greatly improved GO service on local transit networks, especially for off peak and counterpeak travel. With this report, the TTC has seized the initiative in the political debate about transit expansion and could leave Metrolinx in the dust thanks to that agency’s dependence on Queen’s Park to make policy. The focus is on a subway line, something that will keep the Fords happy, but the continued importance of the streetcar system for “in town” trips is part of the overall plan. At long last, we have the TTC openly talking about the need for much-increased rapid transit capacity downtown, a debate that was sidelined decades ago when a proposed DRL was dumped in favour of the Sheppard Subway. A comment on this article sent me looking at the information from the many simulations in the background study to see how the component flows changed, or not, for each configuration of the network. The information is much more easily digested in this consolidated format rather than flipping back between many pages in the source document. The “charts” file linked above contains three pages. The first shows the modelled demand at Bloor-Yonge under various scenarios. Note that “walk in” traffic at Bloor-Yonge is not included in the published data, and this may be important as we will see later. The leftmost column shows the current demand and its source from the three legs of the subway. 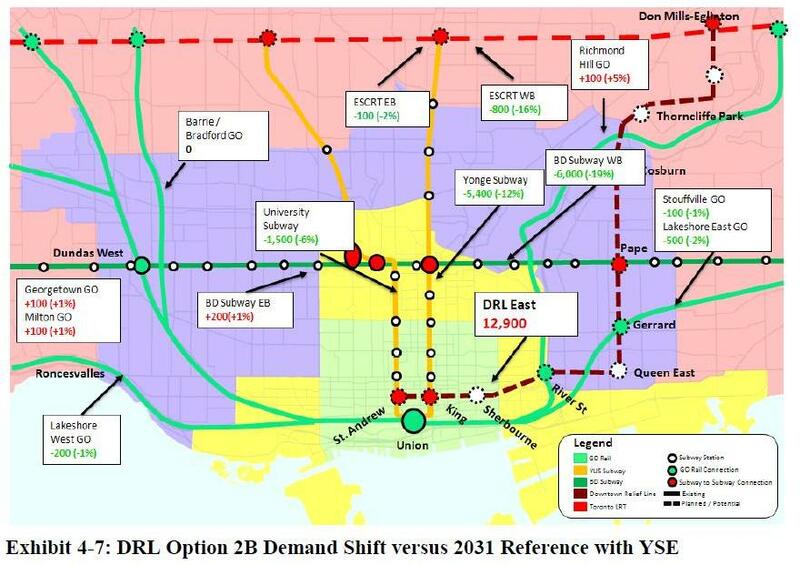 The next two columns show the projected demand in 2031 without and with the Yonge Subway Extension to Richmond Hill. The next six columns show the projected demand in 2031 with the YSE and with each of the six alternatives studied as a “relief” line. The most notable aspect of this chart is that the demand from the north in 2031 with the YSE added in equals all of the existing demand. Growth and new ridership attracted by the extension completely replace the capacity now used by transfer traffic from the BD subway. Various relief schemes reduce the BD transfer demand, but the total travel south from Bloor remains well above current levels in all cases. There are many more transfers from the eastern leg of the subway to southbound service, and a smaller increase from the western leg. There are many more transfers from the northern leg of the subway to westbound service. There are many more passengers arriving from the north and leaving the station. A “relief” line will only address the first of these three groups. The effect can be seen in the lower platform activity for various configurations notably those with a full DRL from Dundas West that intercepts traffic from both directions, not just from the east. The “walk out” traffic is interesting because of the big jump compared to current figures. This is shown on the third chart where the projected number of passengers for whom Bloor-Yonge is a destination (i.e. where they will leave the system) will more than triple by 2031. This begs two questions. First, where are they going? New construction at Bloor-Yonge is overwhelmingly residential, not commercial, and yet a massive rise in “walk out” traffic implies a growth in destinations like offices or schools. Is the land-use information in the demand model valid? Second, if these numbers are accurate, the pedestrian flows through the station exits will also increase substantially. Can the station actually handle this level of activity? The published figures do not include “walk ins”, something that should grow substantially given the amount of residential construction planned for the Yonge-Bloor area. The crucial missing part of the study is the “out of scope” examination of how much demand from the north can be diverted onto GO Transit. Considering the cost of handling the much higher demand on Yonge south, the absence of this information is a glaring omission, and shows the problem inherent with the TTC studying only the “inside 416” effects. It would be nice to say this should be Metrolinx’ job, but that agency is notorious for doing very little in public where the work can be examined and debated. When we are looking at multi-billion dollar options for subway expansion we need to be sure we are not ignoring possible alternatives. For decades, the TTC has downplayed the importance of the DRL as a potential relief valve or the Yonge-University subway. The possible contribution of GO should not be ignored as part of an integrated, dare I say, regional solution. Back on December 2, 1982, the Star ran an article by Rick Brennan. I am not reproducing it in total in respect of copyright, but here are the main points. The forecast for new jobs in the core was 40,000 in the the decade to come, and as many as 90,000 by the year 2000. As we know, the world did not end. What happened? First, the lion’s share of the growth was handled not by in-town trips on the subway, but by the expansion of GO Transit and the rise of commuting from what would become the “905”. Also, actual growth over the two decades did not match predictions due to a severe recession in the early 90s. Ridership fell by 20%, and the TTC obtained unexpected “relief” for its capacity problems. Toronto has now passed its old record ridership set before that crash, but the subway’s capacity has not grown to match. In 1982, the line would have run from Donlands to Union and was predicted to cost $400-million, rather less than the $3.2-billion foreseen for a line from Pape to St. Andrew. Savage noted that surface transit options could not help the problem because of traffic downtown. Nothing much has changed on that count, but more to the point, this is not just a question of drawing lines on a map. If riders are not originating where a surface line can help them, then they won’t divert from their current travel pattern. Another important difference over the two decades is that “downtown” and the residential community serving it are “fatter” than they used to be. At one time, a Queen West subway would have primarily served residential areas to the north and feeder routes from the west. Only a small pocket of high-density development around King and Jameson was well south of the Queen Street corridor. Similarly, a subway to the east would not even consider development south of Queen to the lake. Today, development is pushing south into former industrial lands both east and west of downtown, and the dense area which will be too far for convenient subway service is becoming much “wider”, further away for walking access. At the same time, the job market downtown is spreading away from the core at Bay and King both to the south, and east-west. 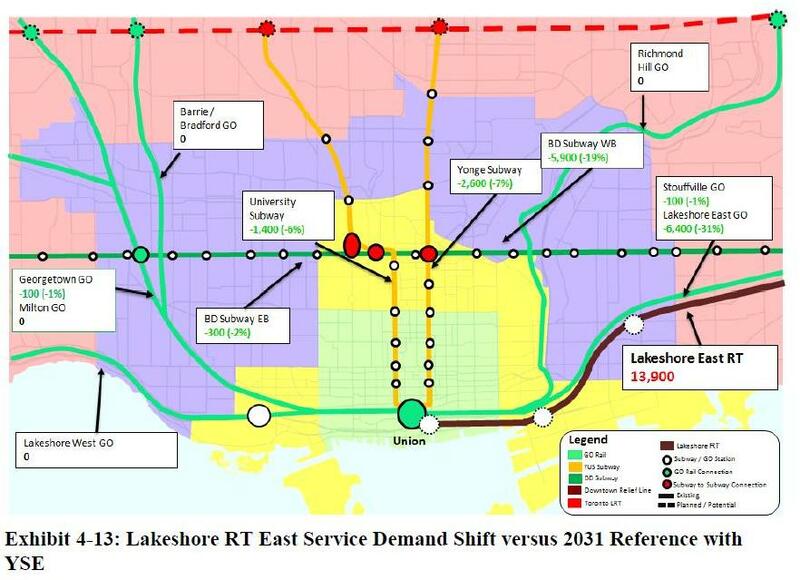 No new rapid transit line can serve all of the growth areas, especially those south of the rail corridor. This was the “old” pre-amalgamation City which was attempting to throttle development downtown by choking off expanded transportation routes. Politically, this put Toronto in the odd position of supporting new subways that would replace pressure on downtown with suburban job growth. Little new suburban rapid transit was built, and the sprawl of homes and jobs through the outer 416 and 905 developed around auto travel. There is an important lesson here for the Official Plan review now in progress. Whatever form we hope to see Toronto take, we must be prepared to see it through with a transportation system that will support the plan rather than sabotage it. Decades of inaction leave us with the need to simultaneously catch up with growth we ignored and to build for growth happening now and in the future. This will not be cheap, and we won’t be able to afford everything we might like to see. The missing DRL is a reminder of what happens when planning ideology trumps actual experience on the ground. This entry was posted in A Grand Plan, Beyond 416, Downtown Relief Line, GO Transit, Subways, Transit, Union Station, Waterfront, Yonge Subway Extension, York Region. Bookmark the permalink. In another thread that at least peripherally dealt with this . . . someone suggested running a rapid transit line all the way to Richmond Hill combined with a DRL, accomplished by linking up with the GO line through a portal north of Don Mills/Eglington. It’s probably way too much to even dream about (anyone want to place bets which is more likely that or moving Yonge/Bloor station), but it just makes so much sense. Fold the money for the Yonge extension into DRL and make better use of existing ROW/infrastructure. TfL is basically doing that now with the Overground, I wonder what Andy Byford would think? I have just finished reading the HDR “Downtown Rapid Transit Expansion Study” and have some questions about their numbers and assumptions. 1. They are only showing 12 car trains on the Milton GO line but GO has 12 car trains on other lines now and I believe are planning to use them on all lines eventually. This would eliminate most of the perceived deficiencies in their tables but I question the accuracy of some of their predictions. Steve: This is one of several problems in the study with the demand model. 2. In section 1.2.4.8 they state the “GO Rail services are operating at or above maximum capacity (assumed to be 1,000 passengers per car which equates to 100% seated capacity) today on almost all lines into the downtown area with most trains carrying standees …” What GO cars carry 1000 passengers? are they talking train capacity for 10 single levels which was about 1000 passengers or do they mean 2000 for 12 car bi level cars? please guys, proof read your manuscript. Steve: Yup. GO Capacity does not seem to be their strong point. 3. In table 4-4-6 they have the capacity of the 72 Pape bus at 4700 passengers per hour with a demand of 3100 per hour. Are they proposing 94 buses per hour or did they drop a decimal point? Steve: The local services fare particularly badly in the demand model because it cannot handle the granularity of demand and travel patterns. There does not seem to have been reasonableness checks done on some of this. 4. In table 4-10 they list the capacity of the waterfront east LRT at 4700 passengers per hour when all the other street car lines run at 2600 passengers per hour. This requires 33 cars per hour or slightly better than 1 car every 2 minutes. Why does this line rate better service than every 3 minutes and why do they arbitrarily run service every 3 minutes on all other lines? Steve: It’s on a right-of-way, don’t ya know, and therefore can have better service. Actually I have problems with the whole 3 minute headway assumption. Clearly there isn’t going to be a King Street subway for well over a decade, and the TTC needs to address service on this route without arbitrary statements about a 3 minute minimum. 5. Why do they not assume that GO will increase the service on any of their lines or does Union Station really place that much of a restraint on the system? Steve: Because they claimed GO improvements were out of scope, although they had no qualms about presuming considerable GO/DRL transfer traffic at Parkdale and at Gerrard/Carlaw where there are no GO stations. GO has stated quite firmly in the electrification discussions that Parkdale is a non-starter for a station because of space and because it is on a curve. Strange how the TTC can blithely add GO stations where none exist, but not service to the most critical lines affecting the DRL study. The extra connections inflate the projected demand on the DRL. I am going to re-read this report and see what other things they have missed. It is likely that GO transit expansion will provide significant relief to the entire transit system, and help facilitate future transit development. As great as the benefits are, the most important has to be the ability to overcome political opposition. The transit debate has seen the destruction of political capital en masse; careers have been made and destroyed arguing about parochial projects. The beauty of GO transit expansion is that its benefits stretch to every corner of the GTA for a price that cannot be beat. At the very least there should be a thorough assessment of the facts to either confirm or deny the truth of what I have just said. 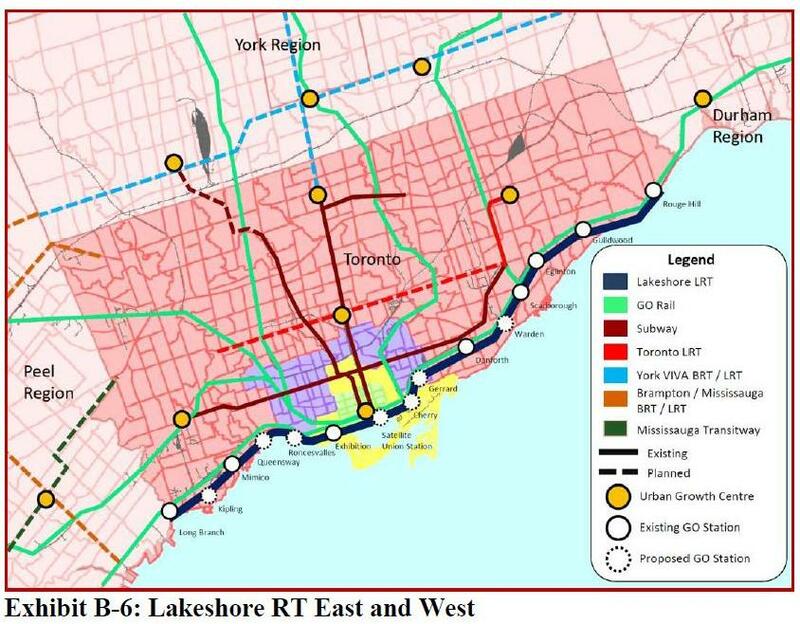 Steve: Equally the TTC should not inflate the peak demand on a DRL by including transfer traffic from GO in near-downtown stations that will never be built, and that riders would be unlikely to use due to fare issues and the need (outbound) to transfer onto trains already fully loaded from Union. @Nfitz something I’ve always thought could work is to close down the Yonge station on the Bloor line and have some kind of walking transfer to Bay. That said, I doubt the current underground mall could handle the increased foot traffic (can barely handle it now without the transit connection) and I don’t know what kind of infrastructure one would have to contend with in order to build an in-system pedestrian tunnel between the two stations. On the other hand, when compared to the underground infrastructure in New York City, it probably would be relatively simple. If any part of the Bloor-Danforth line should be jigged, it should be at Main to better connect it with the GO station there. For next 10 to 25 years before we ever will a see a DRL why not use the one we have? As reported in DRL study the biggest capacity bottleneck is Bloor & Yonge at morning rush hour particularly from westbound Danforth traffic to Southbound Yonge. Add 10-12 tripper runs (every second train or so) between 7:30am-9am through Wye in the morning rush run for downtown service via University. The head-ways on on BD westbound runs from Kennedy can support it an so can University Southbound for next 10 years. Maybe even have the same tripper runs in reverse during PM. Steve: Actually, the University subway cannot absorb any more trains. The AM Peak headway on BD is 141 seconds, or 25.5 trains/hour. If you want to take every other train, you would need to divert about 18 trains over the 90 minute period from 0730 to 0900. This would leave too little service coming east from Kipling after about 0800 (about 12 trains/hour). The southbound service on University is already 25.5 trains/hour from the Spadina line, and there isn’t room for another 12 or so coming off of Danforth. On an every third train basis, you would be diverting about a dozen trains (1/3 of the 36 or so trains in the target period) at a rate of 8 per hour. This would raise the total train count on University to about 33 which the signal system cannot handle. Also, you would reduce the service eastbound from Kipling (to about 18 trains per hour) which could not handle the demand. My suggestion adds Downtown trains between Kennedy and Yonge running westbound AM rush hour therefore reducing head ways in this section only. I am not diverting existing trains that run to Kipling to service returning Eastbound traffic. Also east bound traffic gaps can be managed with pocket trains or service from Keele storage tracks if necessary. As for University southbound headway room is available if you eliminate the some YUS AM short-turn trains and with addition of the new signal system. This idea is stop gap measure until the DRL gets built. Steve: There is not enough track time on BD to fit in the extra trains you propose westbound. As for trains coming in at Keele, the problem is that this move is very time consuming because the train cannot just pull out onto the line and keep moving (think of Davisville southbound as a comparison). Eliminating “some” short-turn trains is an understatement considering that you want to run integrated service for 90 minutes, and considering that the short turn is to be extended north to Downsview. And, no, the new signal system will not give you the extra space you need. The TTC thinks they can get down to 105 second headways, or 34 trains/hour, but have yet to explain what happens when these trains reach a terminal with a physical headway limitation of about 130 seconds that is a function of track geometry, not signalling. Indeed, the whole purpose of the “Yonge-Spadina Loop” proposed years ago with track linking the top end of the Yonge and Spadina lines along Sheppard was to eliminate terminal constraints. Sheppard? That’s where both lines were planned to end at the time. This is the origin of the proposed Sheppard West subway — an operational fix, not a line required by actual demand. With the re-emergence of the DRL into Toronto subway discussion, we can also see a way to make the Sheppard subway more useful. Turn the Sheppard subway south onto Don Mills after the Don Mills station and connect it with the DRL East + Extension to Eglinton model with stations at York Mills-Don Mills, Lawrence-Don Mills, Eglinton-Don Mills, Flemingdon Park, Thorncliffe Park, Cosburn, Pape-Bloor, Gerrard, Queen East, Bayview-River St, Parliament-Queen, Jarvis-Queen, Queen-Yonge, then turn south on Bay to City Hall(Bay and Queen), Stock Exchange(King and Bay) and finally Union (Front and Bay). There will then be three subway lines: Yonge-University-Spadina (YUS) from Finch to Downsview, Bloor-Danforth (BD) from Kipling to Kennedy, and Sheppard-Don Mills-Pape-Queen-Bay (SDPQB) from Sheppard-Yonge to Union. All three lines will have intervals of 2’20” during rush hour and 4’40” other times. This new line will provide nice relief for Yonge-Bloor by diverting patrons from the BD to the SDPQB at Pape. Steve: I look forward to your correspondence with the owners of The Bay and the Simpson Tower at Queen & Bay where you propose a very hard turn. A subway could not possibly be built here without going very deep, or alternately, demolishing the existing buildings. I won’t mention various other pieces of underground infrastructure your route blithely cuts through, but suggest that before drawing lines on a map, you have a better understanding of what is under the streets and the geometry of downtown in three dimensions. I’m not picking specifically on you — this type of blind “lets put a subway here” fantasy shows up from many locals who should know better. In a previous post, you clarified some points for me about the subway system (thank you very much, Mr. Munro!). With that clarification in mind, four subway lines should be established until the DRL is built: Yonge-University-Spadina (YUS) from Finch to Downsview, Bloor-Danforth (BD) from Kipling to Kennedy, Sheppard-Yonge-University-Danforth (SYUD) from Don Mills to Kennedy (using lower Bay), and Sheppard-Yonge-University-Bloor (SYUB) from Don Mills to Kipling (using the Sheppard line to Yonge line interchange I described in that previous post, although a better interchange between the Yonge line and the Sheppard line similar to the one that occurs on the New York City Transit “5” line north of 138th Street-Grand Concourse into 149th Street-Grand Concourse Lower Level would go a long way in facilitating this scheme). YUS and BD will have an interval of 4 minutes during rush hours and 8 minutes off-hours and SYUD and SYUB will have an interval of 8 minutes during rush hours and 16 minutes off-hours. This will serve to keep all TR trains on YUS and all T1 trains on the other 3 lines. With interlining, a commuter can get to the CBD from any station using a single train. During rush hour, there will be service every 2 minutes from York Mills to Museum, every 2’40” from Kennedy to Kipling and every 4 minutes from Finch to Sheppard-Yonge, from Downsview to Dupont and from Bayview to Don Mills. First off, what a *great* forum! I’ve learned incredible amounts just scanning the posts and answers, dialog is of the highest level. I first noted Mikey writing on this topic in an earlier eml, but knew I should scan other posts in case it comes up again, and now I *have* to post, Ray’s post is so compelling. After ascertaining that GO now own the trackage (ex TTR) at Union Station and just a few months back bought the Richmond Hill line up to Steeles … How far north that’s a double track-bed is difficult to tell, what is clear is that TTR took the third track out some years ago around the Don junction bank, the remaining two tracks being head-on leads to the ex-CN and present CP, each operating as a single track. You know, ‘on the cheap’ … and to call both of their bluffs … how about an offer from the TTC to lease, and/or operate (since Metrolinx is considering it below their mandate) an extension of the Airport Express (paths are ostensibly going to be extant at Union, why not do a run-through?) perhaps further bolstered Union to Bloor with intermeshing shuttles with the ex-CN track having a looping just short of the CP bridge over the Don, and a platform feeding a covered escalator up to an extended Castle-Frank Station? Steve: Please, not the Don River to Castle Frank connection again! It’s a very difficult connection and would have passengers transfer to the BD line at its peak, hardly an ideal idea. Just because two lines on a map cross doesn’t mean there should be a transfer station, unless you are a Metrolinx planner and don’t actually look at the sites in question. *If* the CP track southern end could also be bought, or track rights attained, a loop with the ex-CN track could be made just north of the Bloor Viaduct, allowing a station on both sides of the valley connecting Broadview Station also with an escalator. This would spread the passenger load, as would the passenger numbers in the proposed Airport Express 3 car units. Steve: Metrolinx has owned the Don Branch of the CP for some years now, but getting from it to Broadview Station is equally a non-starter. There is a clash of expected comfort of the Airport Express to TTC passenger shuttle, but perhaps enough would pay a bonus fare, along with a TTC subsidy (now there’s an oxymoron) to make it very worthwhile for Metrolinx. Would the relief in numbers be great on Yonge Line? Mediocre I’d guess, but keep in mind crowding is an exponential factor of small linear increases above capacity. It doesn’t take much to cause it, it doesn’t take much to relieve it. Steve: The ARL will run with short trains and even if we bumped the headway, we are not looking at a large diversion of traffic especially for a DRL west. Expensive to do? LOL … well yeah .. .but compared to the TTC’s latest proposal? Hey … comparative peanuts. Add in the interchange of GO passengers coming south on the Richmond Hill Line and interchanging at Don Valley, and it isn’t wasted if superseded later by a more effective relief. Once again though, the question is ‘who funds the infrastructure’ even if farebox and TTC grant cover the rest. Many metropolises have assumed heavy rail RoWs for transit. New York, London, Paris immediately come to mind. Even Toronto in small stretches (Northern Railway RoW in Scarborough). It’s time to cut the massive costs of building new things and start utilizing what’s already extant in RoWs. Steve: The issue with the DRL and its cost is a function of the demand it will carry and the place it will hold in the network. 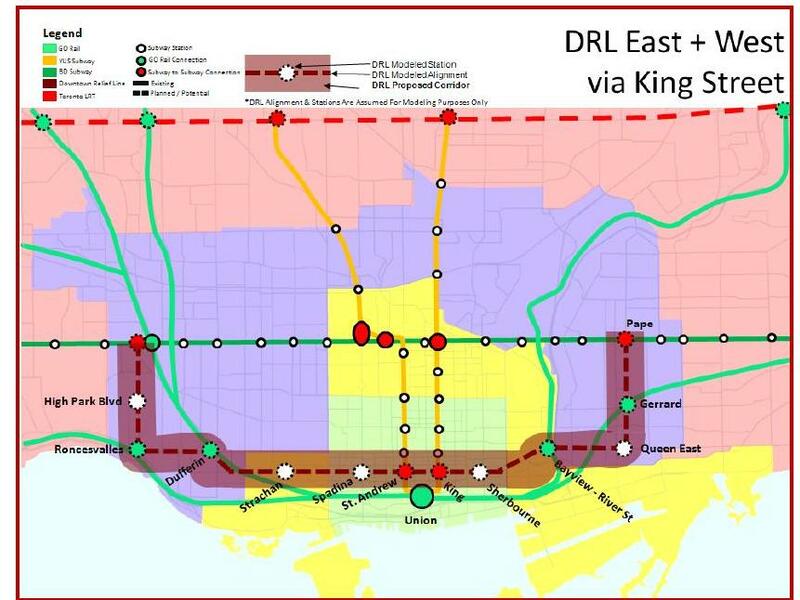 We need to divert thousands of people per hour off of the Yonge line to other corridors of which the DRL is one. We should have built it years ago. The rail corridors, especially those to the north and east, will make a contribution, but expected growth downtown and migration from auto travel will soak up everything we can build. I was struck by the same morsel! There’s an elephant in the train and it’s the Big UnMove. That is the UnTitle of the Report. Anyone who’s spent time in London, NY, Paris, etc can’t help but wonder who had what trackbed and when? They long-ago assumed Rights of Way that got them where they wanted, often electrified to do it. Someone mentioned London’s “Overground” a few posts back. It’s past time to learn. Byford speaks the language, I’m puzzled by the silence. To ‘Steve’: Please pardon my being unacquainted with the html tags. I’ll watch and learn. Excellent forum! Steve: I tend to tidy up a lot of stuff regardless of how formatted (or not) it might arrive. The downtown relief line is sorely needed but the project only makes sense to me if it is built from Eglinton-Don Mills to Dundas West station as a U-shaped line. That way the line provides desperately needed higher-order transit downtown and offers inner-suburban commuters an alternative to the Bloor-Danforth and Yonge lines. It also relieves congestion at Bloor-Yonge station not to mention provides a connection and convenient transfer between the Downtown Relief Line and the Eglinton Crosstown LRT. Building a stub from St. Andrews station to Pape station should provide better service downtown but I fail to see how it will relieve congestion at Bloor-Yonge station and on the Yonge line south of Bloor. It is unlikely that many commuters will transfer from the Bloor-Danforth line at Pape station to the Downtown Relief Line instead opting to continue taking the traditional route via the Bloor-Yonge interchange. Extending the Bloor-Danforth line to Scarborough Town Centre also makes sense considering the number of condo towers that has gone up around the mall recently and the Scarborough RT’s heavy ridership. According to this map the density is there (around the mall) to support a subway extension. As for Rob Ford’s Sheppard subway extension, the map above shows that the density is not there to extend the line along Sheppard Avenue East. However, in Scarborough, the density is there to support a subway from Victoria Park to Brimley along Finch Avenue East. The Sheppard subway can swing northeast from Don Mills station and become the Sheppard-Finch subway terminating at Brimley and Finch or McCowan and Finch. While I don’t myself advocate that all or portions of the existing streetcar network be abolished upon the construction of a downtown relief line, has any consideration been given to what might happen to the existing network should it in fact be constructed? I expect with brand new facilities at Leslie, that the Queen track would need to remain in place, and would serve well the residences east of wherever the DRL turns north, but I suspect demand on the eastern streetcar branches would take a hit – at least for downtown direct trips. Your thoughts Steve? Steve: Much depends on where or if stations were located on the DRL and the exact route it takes into downtown. If, for example, there is no station at Pape/Carlaw, then there is nothing to intercept traffic on the Carlton car. Depending on where the line crosses Queen and on the route it takes into the core area, this might or might not affect the 501 (why get off to change to the subway if you’re already close to downtown). The King car similarly will be affected only if the new line intersects it in a way that makes changing vehicles worthwhile. I have noticed that people (and transit planners) tend to focus on traveller behaviour for inbound trips, but outbound poses its own challenges depending on how crowded outbound surface vehicles would be at the transfer points. A transfer will add a minimum of five minutes to a trip for the surface/subway move, plus the delay to wait for an outbound car. Inbound there is the same transfer delay but, presumably, to a more frequent and reliable subway line and so the penalty is not as great. Think how many people kvetch about changing between the subway and other routes and how passionate this debate has been in various threads on this site. A forced transfer is a difficult sell if the rider previously didn’t have one, especially if the actual time saving is minimal. 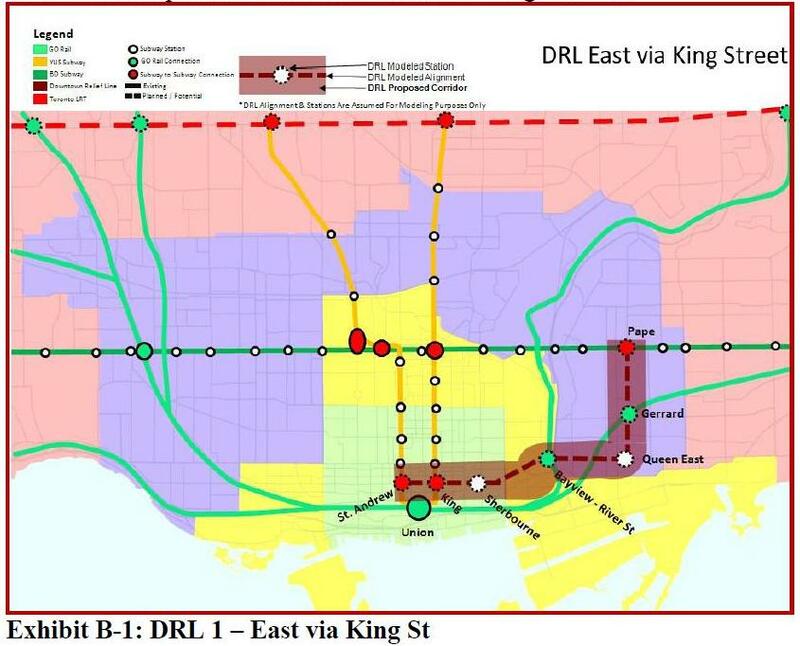 One big reason I argue for continuing the DRL north from Danforth is that it would provide a direct route to downtown for people coming from the north. If a bus-to-subway change is made at Danforth, more of them may take their chances going west. Given the influx of people the Eglinton will add to the already packed Yonge line, and the relatively good network in place south of the Danforth (subway and streetcar) it would almost make more sense to me to limit the number of stations south of Danforth (to save money) and use that money to construct stations where transit access to downtown is less developed (north of Danforth as you propose, Steve). If the true purpose of the DRL is to divert traffic from the Yonge line, I expect little or no benefit is to be gained by diverting traffic from the College/Dundas/Queen cars, when the bulk of the traffic is originating/destined to/ from north of Bloor/Danforth. I would almost go as far as to say that if you didn’t built it up to Eglinton, then it wouldn’t be worth building, though as subways go in Toronto, it seems as though you have to plant the seed and then graft on extensions as funds permit. I was thinking that for the DRL to really take pressure off the Yonge line, on the east side it would have to go as far north as Sheppard, maybe even Finch. I was at a public meeting around Yonge/Eglinton on public transit last year and they complain that in the morning they can’t get on the Yonge line because it is too crowded. Just imagine what it will be like in the minimum 10 years once the new subway line gets going. Maybe we should start calling it the Don Mills line? I like LRTs and hope more lines are constructed as well after the current 4 are in place but that’s another discussion. By the way, I was going to write to my councillor today to suggest having a referendum during the next election on funding/construction for subways and other rapid transit. Steve: I have suggested calling it the “Don Mills” line for a while, but the DRL moniker is a hard one to shake. As for the TTC, with their reticence to build anything at all (until quite recently), and then only to Danforth, the name “Don Mills” doesn’t exactly register. I didn’t agree with all of the One City plan but I think most people could agree with the Don Mills lrt going south from Steeles to Eglinton lrt line and also the Jane lrt to take riders off the Spadina and Yonge line (especially this one).